Paddy Jampin Jaminji was a ceremonial leader amongst his people. He became, due to a strange twist of fate, the founder of the contemporary painting style of the East Kimberley region. A respected elder during the establishment of the Warmun Community in the early 1970’s after having been a stockman for most of his working life, he settled at Turkey Creek following the upheaval in the pastoral industry after the Federal Government equal pay decision. Paddy was Rover Thomas’s classificatory ‘uncle’ and, in 1974, when Darwin was destroyed on Christmas day by Cyclone Tracy, they interpreted it as a manifestation of the Rainbow Serpent warning them to make a stand against sliding into the Gadiya (white man’s) ways. This cataclysmic event at the region’s centre of European influence became, for Gija people in particular, the catalyst for cultural revival. While Rover Thomas, would later become the leader of this new art movement, it was Jaminji, who was initially the most prolific producer of the paintings that were associated with the story and ceremony, which would come to be known as the Krill Krill or Gurrir Gurrir. 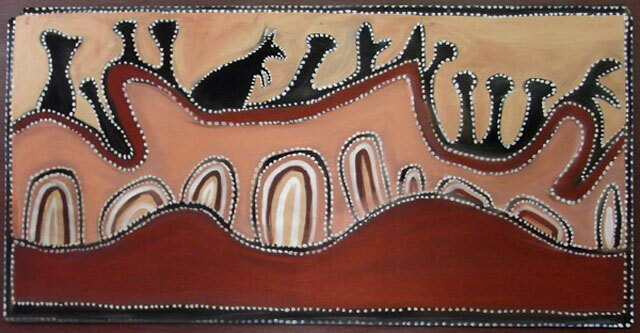 Rover Thomas described himself as apprentice and confidante to the older man as Jaminji’s great store of knowledge about the land, its features and spiritual significance, provided the grounding for the new ideas and images that would eventually infuse his unique and evocative ceremonial paintings with their strong traditional links. From his first works in the late 1970’s, Jaminji’s paintings stood apart from the better-known, multi-hued acrylic dotted works that were being created at Papunya during the same period. Jaminji, and those who followed, chose to work only in traditional ochres, which rendered a highly textured surface, conveying a warm, earthy quality. Jaminji’s diagrammatic depiction of the landscape, which followed the actual contours of the country, and used the earth itself as the medium, imparted the feeling that the actual traces of the events, which unfolded through time, were embedded in the works. That feeling is evident in the work illustrated above. As with many of Paddy Jaminji’s most emblematic paintings, mythic creatures are depicted in a figurative style. These could include devil-devils, and Tawurr, the Half Kangaroo that was transformed into a rock at Elgee Cliffs, the site of an ancient cave painting and Dreaming place. During the Krill Krill ceremony, the spirit stops to acknowledge Tawurr, ensuring the continuity of the spiritual powers that he imparted which are inscribed within the cliffs just as Jaminji’s painting appears to capture the spirit of this ancient being. The work illustrated is entitled Cockburn Ranges. The spirit of the Kangaroo is physically evident as its presence is asserted from within the landscape. The painting was collected in 1983 having been created on a piece of discarded construction ply measuring 48 x 121cm, and is now presented floating in a box frame under glass. Works like this, created during the time that Jaminji worked as a gardener at the Argyle Diamond Mine, were sold to contractors, mine advisers and others. Later, Mary Macha purchased his works along with those of Rover Thomas. She converted her garage into a studio for Rover Thomas and occasionally Jaminji during their time down south and continued to purchase Jaminji’s paintings throughout the early and mid 1980’s until by 1987 he was almost completely blind. Paddy Jaminji’s paintings were created in the early days of the Aboriginal art ‘market’ and long before Aboriginal artworks sold for more than $10,000. Very few were available outside of the small number of outlets supplied by Mary Macha. His works did not appear at auction until 1997 when all 4 works offered sold for a total of $58,075. Since then they have been received with a very healthy 70% clearance rate. Yet his production was small and so far only 61 offerings have ever been recorded and a number of these are repeats. His auction results do not reflect a great deal of difference between works painted early or late in his career, for sale or ceremony. Generally the larger the work and the more engaging the image, the higher the price it has received. The average price paid to date for works more or less 180 x 90 cm. in size is $56,188 while works around the 120 x 90 cm. range have averaged $18,817. Smaller 90 x 60 cm. paintings have achieved a mean of $15,422. Despite their formal composition, Paddy Jaminji’s works emanate a sense of power and freedom befitting the work of a man deeply versed in his tradition who spent most of his life working with cattle and moving them across the land. He was the inspiration behind Rover's decision to paint and went on to inspire many others including, late in his life, Lena Nyabi. The themes for his works were derived from his own beliefs, cultural iconography and working experiences and it is this intimate knowledge of tradition and country that imbues his paintings with their deep meaning.